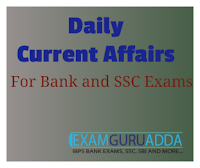 Dear Readers, we are presenting Daily Current Affairs for All Exams- 23rd September 2016. 1. India, United States and Afghanistan have reaffirmed their shared interests in combating terrorism and advancing peace and security in the region. In this regard, a trilateral statement was issued after meeting of their delegates in New York on the sidelines of the 71st session of UN General Assembly. 2. Three countries reaffirm their shared interests in advancing peace and security in the region, as well as countering terrorism. They have exchanged views on the situation in Afghanistan and on regional issues of mutual interest. 1. The Union Government has appointed Navtej Sarna (59) was appointed as Ambassador to the United States. He will take over from Arun Kumar Singh, who has retired from the service. In his new role he will face the task of engaging with the new administration in United States following the November 2016 Presidential poll. 2. He is an Indian Foreign Service (IFS) officer of the 1980 batch. In his career spanning 35 years, he has handled several important assignments at the MEA. Prior to this appointment he was serving as India’s High Commissioner to the United Kingdom. 1. NITI Aayog, the think tank of union government, has devised a short –term and medium-to-long term action plan to help India achieve 50 medals in 2024 summer Olympics. 2. In its action plan for revitalising sports in India, Niti Aayog said, India still does not have a conducive environment for sports to polish the talent of Indian sports persons and make them at par with their global counterparts. 1. India and France inked the 7.8-billion Euro deal for 36 Rafale fighter jets. As per the deal, the aircraft will be equipped with latest missiles and weapon system like Meteor and Scalp. 2. The 7.8 billion Euro deal is crucial for the Indian Air Force and is expected to give India the dominant status in the air. The deal was signed in New Delhi by Defence Minister Manohar Parrikar and his French counterpart Jean Yves Le Drian. 1. Two Indian forest officials, Sanjay Dutta and Ritesh Sarothiya, have been selected for the 2016 Clark R. Bavin Wildlife Law Enforcement Awards. Clark R. Bavin Wildlife Law Enforcement Awards honours individuals engaging in exemplary law enforcement actions to protect wildlife. 2. Sanjay Dutta is the range officer of Belakoba Forest Range Jalpaiguri in West Bengal and Ritesh Sarothiya is the assistant conservator of Madhya Pradesh State Forest. 3. The award ceremony will be held on 3 October 2016 at the 17th Conference of the Parties (CoP) of the Convention on International Trade in Endangered Species of Wild Fauna and Flora (CITES) in Johannesburg, South Africa. 1. Justice Mohan M Shantanagoudar was sworn in as Chief Justice of Kerala High Court as per Article 219 of the Constitution. He was administered oath to office by the Governor Justice (Retd) P. Sathasivam at a function held at Raj Bhavan. 2. Prior to this appointment he was serving as the acting chief justice of the Kerala High Court.